← What Do We Have That They Don’t? 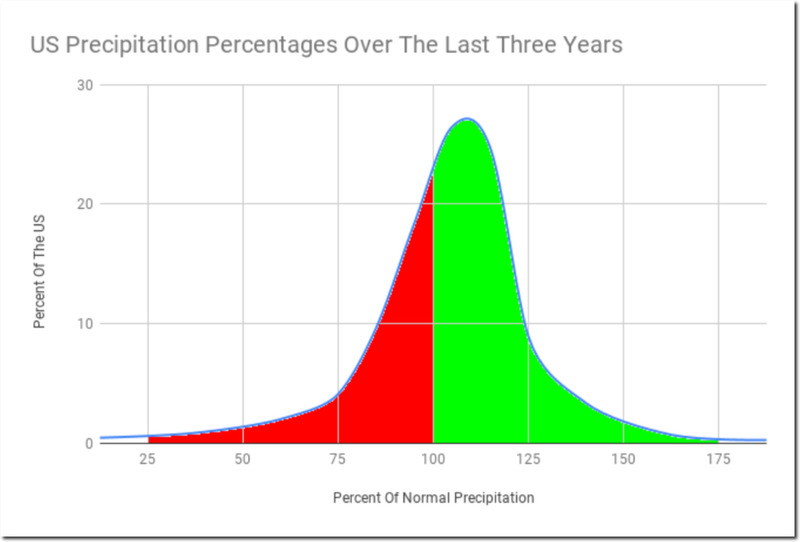 Two thirds of the US has had above normal precipitation over the last three years, including nearly half of California. Thirty years ago, James Hansen predicted a huge increase in drought, and said that droughts hardly ever happened in the 1950’s. The 1950’s had the most persistent droughts on record, with the US in drought about 50% of the time, not 5% as Hansen claimed. 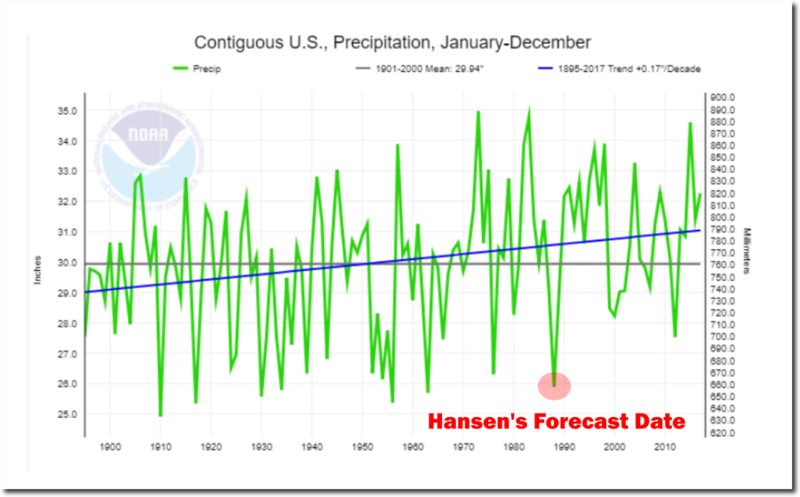 Since then, and particularly since Hansen’s 1988 forecast, the US has been getting and wetter and droughts have become much less frequent. 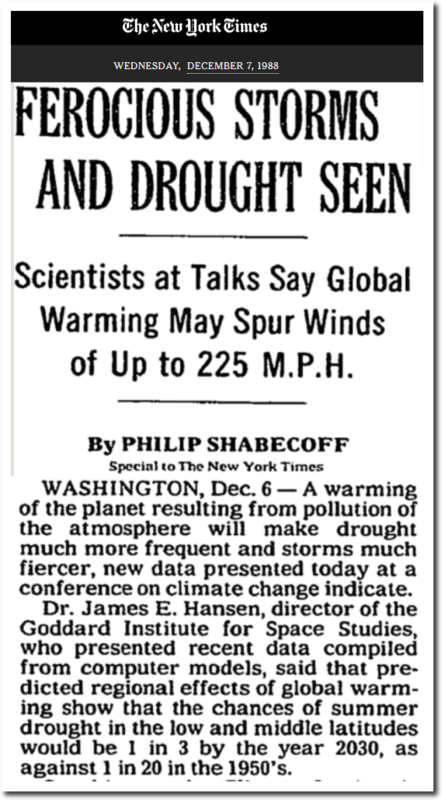 Hansen not only failed to predict the future, but he didn’t know anything about the past either. The more incompetent and clueless climate scientists prove themselves to be, the more Democrats trust and idolize them. DFW rainfall this year is #3 since records started, with three record months. Skiing is off to a great start in Colorado with several areas opening early and Loveland reporting their most early season snow ever (began 1936). seems to me if you take out the high snoe fall over the mountains, then California id pretty much still in serious drought. I think there’s a connection – climate change. Paradise is burning: what bigger sign do you need? In science, we do not look for “signs”, we look for evidence. Your religion is showing Ms Griff. Man-made global warming obviously lodged itself in western North America. You mean man-made global warming is about cotton pickin’ cherry pickin? What you seem to be saying is that the desert regions in California are still displaying symptoms of a, well, desert. And how long has it been a desert? They had moved south to California. Then on the most recent but now late interglacial they moved back to BC. Of course, they will eventually move south again. Should have included that the cedars got back to BC some 6,000 years ago. 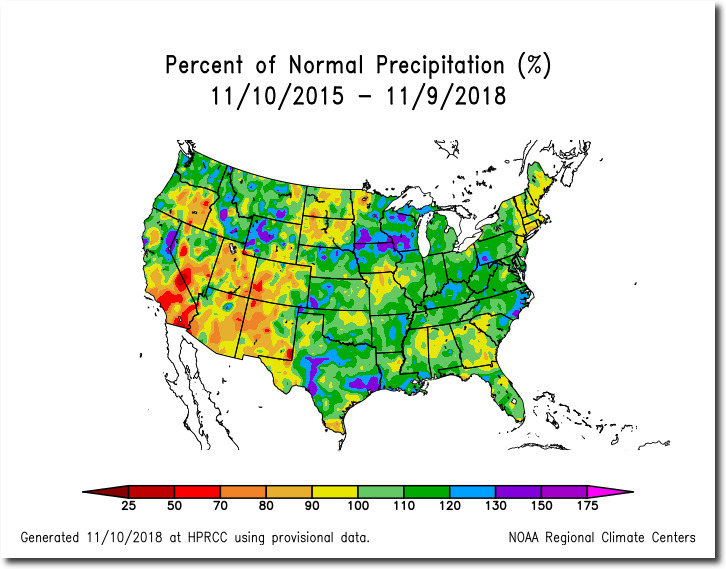 Yer Griff, if you ignore the normal primary supply of fresh water – snowpack, and ‘normal’ California weather, and falsely claim fires are ‘climate change’……. You made the effort to research the history of drought in California rather than immediately responding with your usual knee-jerk response of must be “climate change”(short for man made climate change). Tony has made numerous postings on historical droughts in California. The historical data show these droughts to be natural so what evidence do you have to label the latest alleged drought as man-made? I looked, I checked… and there’s a change. You can’t keep DENYING CLIMATE history griffool. !! Long droughts and extreme weather swings in California are the norm, not the exception. Research indicates the current (over)development in California coincides with the wettest period in the last 7,000 years. How would a 240 year drought work out? Or an ARKstorm? In the meantime, Butte County, CA, can’t catch a break. Heavy precipitation just two winters ago filled reservoirs above safe levels, leading to massive water releases and subsequent damage at the Oroville Dam. Video linked was produced by the USGS in 2011. Yet another griffool post based on IGNORANCE and DENIAL of climate history. How can there be Paradise in progressive California? It is not about climate it is about the stupidity of living inside a pine forest . It’s not IF it could happen but WHEN it would happen. Your ignorance is showing Griff. Again! First: They build homes INSIDE a Pine forest. OMG you really are a MORONICALLY IGNORANT griffool. Droughts are common in the area affected., often far worse than now. Why do you continue to choose to be so IGNORANT about simple climate history, griffool?? Why your continual CLIMATE DENIAL? California always has and always will be prone to drought. 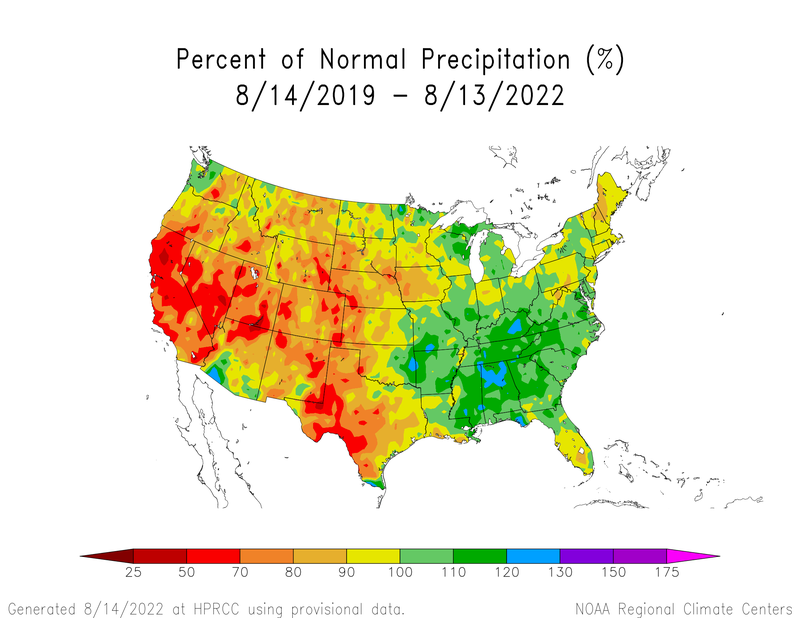 But what alarmists conveniently ignore is that the all important Corn Belt has been far LESS prone to drought in recent years. 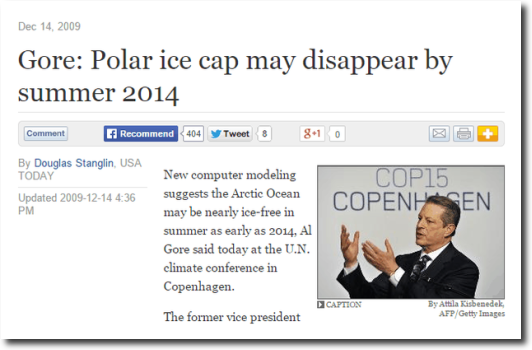 That is not at all what the alarmists had predicted! This is off thread, but I want to post it before I forget it. There seems to be rule developing for lost ballots boxes. When found, 97% of them will be for the Democrat candidate. Oh wait – there physicists not climatologists ! So it’s not basic physics? Do we really know the global average wind speed? ( Since the 1960s) They are claiming a 2 mph reduction. Remaining skeptical. And, what do you know? Only today another “prediction” from the Australian Bureau of Meteorology that this forthcoming (Australian) summer will be “the hottest & driest” – blah, blah – so we’ll see won’t we? As one who has lived “on the land”, and from the inland; and in view of Tony’s superb research, it will not come as any surprise when the normal seasonal weather pattern prevails! That’s the reason Hollywood stars want to live there. They are on the Global Warming bandwagon but live in one of the driest and warmest places in the US, voluntarily. They hate the cold and rain but love outdoor swimming pools..
Griff: droughts come & droughts go. Australia ?? is an absolutely classic example of that. In one of his blog posts Tony dredged up a very old Australian newspaper report showing the history of this since the arrival of the First Fleet at what is now Sydney in 1788. And guess what? Drought, flood. drought, flood, etc. over the years. And what’s changed? NOTHING! A short drought., happened many times before in that region. Griffool is always a DENIER of climate history. Or just chooses to be plain IGNORANT. … about everything.!! So Griff, in the last 1000 years California has had two droughts that lasted over a century. Did humans cause those? Yes. More specifically, it was straight white european male islamophobic sexist neo-confederate anti-nativist capitalist racist homophobic linear thinking running dogs of Wall Street hate mongers. With time machines. And then they all smoked cigars and laughed… ha ha ha ha ha! at all the destruction they had caused.